1. 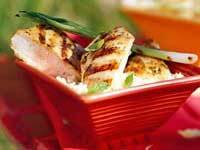 Place chicken in a resealable plastic bag set in a shallow dish. 2. In a blender, combine the 1/2 cup mint leaves, the lemon juice, oil, soy sauce, garlic, chili powder, and pepper. Cover and blend until smooth; pour over chicken. Seal bag; turn to coat chicken. Marinate chicken in refrigerator for 4 to 24 hours.